We offer a great selection of high performance home audio components! 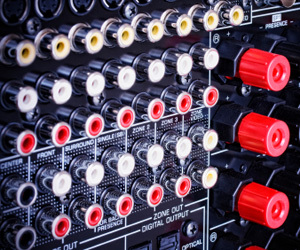 It is generally accepted by the professional audio community and audio enthusiasts throughout the world that the use of separate components; pre-amp, power amp, and or integrated amplifier, will improve sound quality over single chassis units (Receivers). Lower noise, lower distortion, greater dynamic range and higher quality power, to name a few performance parameters, are improved as the result of separating each part of the electronics. Noise causes a loss of detail, space, and air in the way we hear music. The major cause of noise is the amplifiers power supply being crammed into the same box as the critical low level analog and digital circuits of the pre-amp. By removing the power amp, from the same box as the pre-amp, we reduce the noise by a factor of 10! Then take the tuner out of the box and the noise, caused by stray RF, is reduced even more. Distortion is the adding of sound that should not be there. It causes the music to become bright or harsh along with a loss of detail. There are many different forms of distortion caused by electronics, most of which are related to having too much in one box. By having separate power supplies for each component most of these distortions are lowered again by a factor of 10! Dynamic range is the difference between soft and loud. When the noise levels are high the very soft sounds are inaudible. When you don’t hear soft sounds you reduce dynamic range. High quality power refers to the ability of the amplifier to drive and control the speakers not just make sound through them. When you have a dedicated amplifier all of the noise generating components can be isolated from each other thanks to more room in the chassis. You can use a larger power supply, bigger transformers and capacitors to deliver more clean power into lower impedance speaker loads. Most of the advantages, of separate components, translate over to high quality integrated amps as well. Though not taking the power amp out of the chassis by removing the tuner it allows for more space to shield the critical components from power supply and RF noise. Integrated amps are the best sounding product per dollar you can buy.